Cats are furry purr-machines that bring unmatched joy to our lives. Kittens are furry little balls of love that take that cuddly feeling to epic new heights. The five delightful kittens featured in Smitten Kitten are the cat’s meow and will happily curl up to other feline-focused sets in your collection. 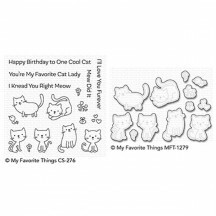 This 15 piece set includes: Kittens (5) 1 ¼” x 1 5/8”, 1 ¼” x 1 5/8”, 1 5/8” x 1 ¼”, 1 5/8” x 1 ¾”, 1 ½” x 1 5/8”, Hearts (2) 3/8” x 3/8”, ¼” x ¼”, Bowl 5/8” x 5/16”, Bow 7/16” x 1/4”, Sentiments (6) ranging from 1 ¾” (meow are you?) to 3 3/8” (hope you’re feline better soon) in length.